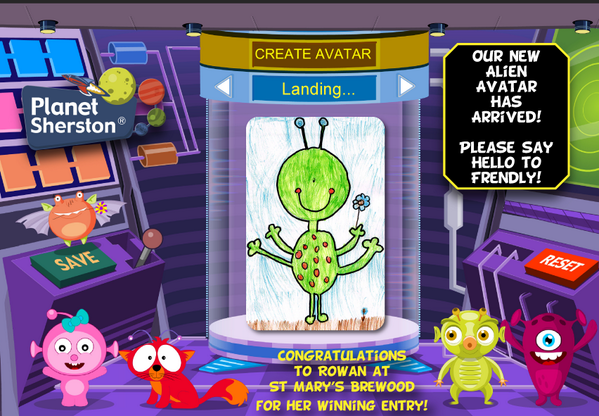 Design An Alien Avatar: The Winners Are Announced! If you follow Webanywhere on Twitter (@webanywhere_ltd) you may have seen that Planet Sherston have now announced the winners of the Design An Alien Competition. What a fine selection of aliens they are! The competition was launched just before Christmas, with every primary school in the UK invited to enter their best alien artwork. The winners would win Planet Sherston goodies for their school’; the alien crowned the overall winner would then be recreated and appear as a brand new character in Planet Sherston.